The Station is at the Church of St. Susanna, a Roman virgin who was martyred under the Emperor Diocletian. This sanctuary was one of the twenty-five parish churches of Rome in the fifth century. The analogy between the circumstances of the martyrdom of St. Susanna (11th August) and the account of the test of the chaste Susanna of the Old Testament, has decided the choice of the Epistle of the Mass for today. As is often seen in the Lenten liturgy, both Epistle and Gospel illustrate the same thought. Today both the Epistle and Gospel recall an accusation of adultery which falls back upon its authors. The Epistle speaks to us of the chaste Susanna who is innocent, and the Gospel of a woman who is guilty. God avenges the rights of justice with regard to the first by rewarding her virtue, whilst He opens the treasures of His mercy towards the second by pardoning her because of her repentance. Moreover, the choice of the Gospel is explained by the face that the stational procession must pass through one of the most infamous quarters of Rome. i.e. the Vicus Suburranus. Hearken to my words, O Lord, attend to my sighing. Heed my call for help, my King and my God! Ps 5:4 To You I pray, O Lord; at dawn You hear my voice. V. Glory be to the Father, and to the Son, and to the Holy Ghost. R. As it was in the beginning, is now, and ever shall be, world without end. Amen. Hearken to my words, O Lord, attend to my sighing. Heed my call for help, my King and my God! Grant, we beseech You, almighty God, that we who chastise our flesh by abstaining from food, may fast from sin by striving after righteousness. Through Jesus Christ our Lord, Who liveth and reigneth with Thee in the unity of the Holy Ghost, one God Forever and ever. R.Amen. EPISTLE Dan 13:1-9, 15-17, 19-30, 33-62. In those days, in Babylon there lived a man named Joakim, who married a very beautiful and God-fearing woman, Susanna, the daughter of Helcia; her pious parents had trained their daughter according to the Law of Moses. Joakim was very rich; he had a garden near his house, and the Jews had recourse to him often because he was the most respected of them all. That year, two elders of the people were appointed judges, of whom the Lord said, Wickedness had come out of Babylon: from the elders who were to govern the people as judges. These men, to whom all brought their cases, frequented the house of Joakim. When the people left at noon, Susanna used to enter her husband’s garden for a walk. When the old men saw her enter every day for her walk, they began to lust for her. They suppressed their consciences; they would not allow their eyes to look to heaven, and did not keep in mind just judgments. One day, while they were waiting for the right moment, she entered the garden as usual, with two maids only. She decided to bathe, for the weather was warm. Nobody else was there except the two elders, who had hidden themselves and were watching her. Bring me oil and soap, she said to the maids, and shut the garden doors while I bathe. As soon as the maids had left, the two old men got up and hurried to her. Look, they said, the garden doors are shut, and no one can see us; give in to our desire, and lie with us. If you refuse, we will testify against you that you dismissed your maids because a young man was here with you. I am completely trapped, Susanna groaned. If I yield, it will be my death; if I refuse, I cannot escape your power. Yet it is better for me to fall into your power without guilt than to sin before the Lord. Then Susanna shrieked, and the old men also shouted at her, as one of them ran to open the garden doors. When the people in the house heard the cries from the garden, they rushed in by the side gate to see what had happened to her. At the accusations by the old men, the servants felt very much ashamed, for never had any such thing been said about Susanna. When the people came to her husband Joakim the next day, the two wicked elders also came, fully determined to put Susanna to death. Before all the people they ordered: Send for Susanna, the daughter of Helcia, the wife of Joakim. When she was sent for, she came with her parents, children and all her relatives. All her relatives and the onlookers were weeping. 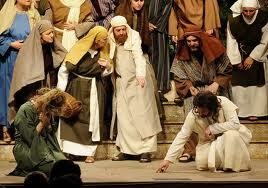 In the midst of the people the two elders rose up and laid their hands on her head. Through her tears she looked up to heaven, for she trusted in the Lord wholeheartedly. The elders made this accusation: As we were walking in the garden alone, this woman entered with two girls and shut the doors of the garden, dismissing the girls. A young man, who was hidden there, came and lay with her. When we, in a corner of the garden, saw this crime, we ran toward them. We saw them lying together, but the man we could not hold, because he was stronger than we; he opened the doors and ran off. Then we seized this one and asked who the young man was, but she refused to tell us. We testify to this.The assembly believed them, since they were elders and judges of the people, and they condemned her to death. But Susanna cried aloud: O eternal God, You know what is hidden and are aware of all things before they come to be: You know that they have testified falsely against me. Here I am about to die, though I have done none of the things with which these wicked men have charged me. The Lord heard her prayer. As she was being led to execution, God stirred up the holy spirit of a young boy named Daniel, and he cried aloud: I will have no part in the death of this woman. All the people turned and asked him, What is this you are saying? He stood in their midst and continued, Are you such fools, O Israelites! to condemn a woman of Israel without examination and without clear evidence? Return to court, for they have testified falsely against her. Then all the people returned in haste. And Daniel said to them: Separate these two from one another that I may examine them. After they were separated one from the other, he called one of them and said: How you have grown evil with age! Now have your past sins come to term: passing unjust sentences, condemning the innocent, and freeing the guilty, although the Lord says, ‘The innocent and the just you shall not put to death.’ Now, then, if you were a witness, tell me under what tree you saw them together. Under a mastic tree, said Daniel; for the Angel of God shall receive the sentence from Him and split you in two. Putting him to one side, he ordered the other one to be brought. Offspring of Chanaan, not of Juda, Daniel said to him, beauty has seduced you, lust has subverted your conscience. This is how you acted with the daughters of Israel, and in their fear they yielded to you; but a daughter of Juda did not tolerate your wickedness. Now, then, tell me under what tree you surprised them together. Under an oak, he said. Your fine lie has cost you also your head, said Daniel; for the Angel of god waits with a sword to cut you in two so as to make an end of you both. The whole assembly cried aloud, blessing God, Who saves those that hope in Him. They rose up against the two elders, for by their own words Daniel had convicted them of perjury. They inflicted on them the penalty they had plotted to impose on their neighbor: they put them to death. Thus was innocent blood spared that day. Even though I walk in the dark valley, I fear no evil; for You are at my side, O Lord. V. With Your rod and Your staff that give me courage. O Lord, deal with us not according to our sins, nor requite us according to our crimes. V. Ps 78:8 – 9. O Lord, remember not against us the iniquities of the past; may Your compassion quickly come to us, for we are brought very low. [kneel] V. Help us, O God, our Savior, because of the glory of Your Name, O Lord; deliver us and pardon our sins for Your Name’s sake. At that time, Jesus went to the Mount of Olives. And at daybreak He came again into the temple, and all the people came to Him; and sitting down He began to teach them. Now the Scribes and Pharisees brought a woman caught in adultery, and setting her in the midst, said to Him, Master, this woman has just now been caught in adultery. And in the Law Moses commanded us to stone such persons. What, therefore, do You say? Now they were saying this to test Him, in order that they might be able to accuse Him. But Jesus, stooping down, began to write with His finger on the ground. But when they continued asking Him, He raised Himself and said to them, Let him who is without sin among you be the first to cast a stone at her. And again stooping down, He began to write on the ground. But hearing this, they went away, one by one, beginning with the eldest. And Jesus remained alone, with the woman standing in the midst. And Jesus, raising Himself, said to her, Woman, where are they? Has no one condemned you? She said, No one, Lord. Then Jesus said, Neither will I condemn you. Go your way, and from now on sin no more. Steady my footsteps according to Your promise, and let no iniquity rule over me, O Lord. Grant, we beseech You, almighty God, that the offering of this sacrifice may always cleanse and strengthen the weakness of our nature. Through our Lord Jesus Christ Thy Son. Who liveth and reigneth with Thee in the unity of the Holy Ghost, one God Forever and ever. R.Amen. Has no one condemned you, woman? No one, Lord. Neither will I condemn you; now sin no more. We beseech You, almighty God, that we may be numbered among the members of Him, Whose Body and Blood we receive in communion. Through our Lord Jesus Christ, Who livest and reignest, with God the Father, in the unity of the Holy Ghost, one God For ever and ever. R. Amen. Stretch forth to Your faithful people, O Lord, the hand of divine help, that they may seek You with their whole heart, and may be found worthy to obtain the things they implore in the right way. Through our Lord Jesus Christ, Who livest and reignest, with God the Father, in the unity of the Holy Ghost, one God For ever and ever. R. Amen.